Explore Vietnam’s culture through its mouth-watering cuisine on an exciting culinary tour, as well as an array of cultural highlights through three of Vietnam’s most fascinating cities. Meet vendors at markets and learn to cook popular Vietnamese delicacies. 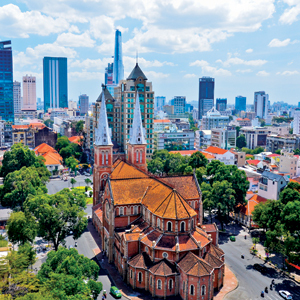 Savor the culture and cuisine of Hanoi with its well-preserved colonial buildings, ancient pagodas, and unique museums. Hoi An, a charming UNESCO heritage fishing village, is replete with narrow, lantern-lit lanes dotted with French cafés, spas and beaches. Ho Chi Minh City, formerly known as Saigon, is rated as one the 10 best places in the world for street food. French colonization has left its mark on this vibrant city and you’ll find lovely boulevards, historical museums, and pulsating markets around every corner.